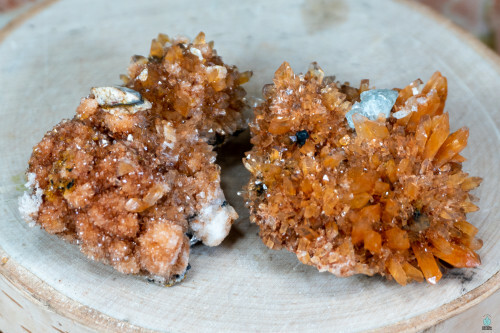 Creedite is a rare mineral that is formed from the oxidation of Fluorite ore and can be found in white, orange, purple, and even colorless formations. This stone was first found in Creede, Colorado which is where its name comes from. The orange varieties are easily recognizable due to their clustered hedgehog-like spikes and are said to be the purest of the Creedite varieties. This specific type is primarily found within a mine in Mexico that also contains the very rare Pink Fluorite. More common varieties of this stone are found in USA, Tajikistan, and Kazakhstan. Creedite is a high energy stone that is known for its ability to attune one to higher spiritual vibrations. It uplifts one's vibrations so that they may experience higher realms, channel messages, and attune to universal wisdom. Through this attunement, Creedite can enhance spiritual communication on all levels, assisting in attunement with the Akashic Records and helping to interpret the messages from your spirit guides. Creedite aids greatly in understanding the abstract communications that often come with higher realm experiences, making it an excellent ally for those looking to gain a further understanding of the messages and wisdom they are receiving. This is is especially effective for those who are embarking on new spiritual journeys or who are unfamiliar with crystals as it expands one's sensitivity to energy and overall awareness. This stone provides one with the spiritual and mental clarity needed to move to higher frequencies and levels of understanding in all aspects of existence. When working with or wearing this stone, one can feel the activation of the third eye and crown chakras almost immediately. It will attempt to clear any and all blockages in the higher chakras, helping one to make the "jump" to higher consciousness. During meditation, Creedite has been known to open up and activate the heart with high vibrational frequencies. This allows one to draw divine light into the heart through the higher chakras and to bring it into their physical daily life. Creedite is truly a stone of inner peace that replenishes the aura and greatly increase its base frequency. Grounding stones such as Black Tourmaline and Shungite are highly recommended when using this stone to help stay grounded, ease the high vibrations of the stone, and prevent one from becoming overwhelmed. Creedite and Moldavite is an excellent example of 2 stones that can work well with one another, especially for those who are accustomed to the higher frequencies. As the Creedite helps you ascend to higher levels, Moldavite is aids in transforming you into the person you truly want to be.